Providing high-school students with more options to high-wage jobs in partnership with local manufacturing companies means everyone wins: employers, students, and the Portland economy. 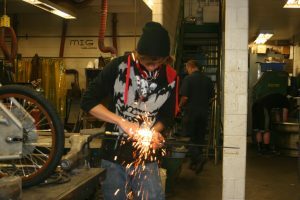 Portland-area anti-poverty non-profit Impact NW provides students with training & connections to important, highly needed, high-wage manufacturing jobs right out of high school. Pathways to Manufacturing, a program of Impact NW, transforms the lives of Portland-area teens who may be at risk of not graduating high school or who are at risk of falling into poverty post-high school. Kacy worked with Pathways to Manufacturing staff on career skills like resume building and interviewing, and manufacturing training with partner organizations like Vigor. A short while later, Kacy was a full-time employee at Vigor. “It was a huge, huge difference in my life. If I didn’t have Pathways, I wouldn’t have this opportunity. I wouldn’t be where I’m at in life,” says Kacy.